Highlighting Mercedes-Benz&#8217;s new &#8217;09 SL lineup, the 518-hp SL63 AMG brings the luxury roadster&#8217;s performance within a fender of true everyday supercars. PALM SPRINGS, CA – Dripping with industrial-grade panache, Mercedes-Benz’s SL roadsters easily blend into the self-conscious car culture of the sun-drenched Los Angeles basin. The posh, hedonistic market is hugely important for the German auto maker’s big convertibles, which get numerous improvements for ’09, including revised aesthetics and a new mechanical active-steering system that will greatly improve the agility of the standard models when it’s made available next year. 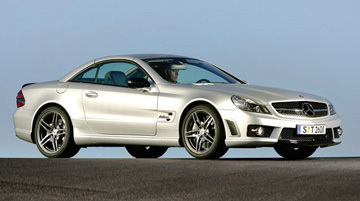 However, to show the new SL’s curbside zeal is not without mechanical gusto, Mercedes-AMG GmbH introduced the ’09 SL63 AMG performance version in the desert here, where the empty mountain roads resemble rally stages and the striking vistas pour unfiltered into the car’s carbon-fiber-trimmed cockpit. Replacing the previous supercharged SL55, the SL63 offers the most thorough redesign in the new lineup, which arrives at U.S. dealers in May. Although it lacks the thrust of the mostly carryover SL65 and its 604-hp bi-turbo V-12, the SL63 is a proper athlete and sports the highest output (518 hp) of AMG’s bespoke 6.2L V-8. A new Speedshift MCT 7-speed automatic transmission offers a startling improvement over the lumbering 5-speed in the SL55 and V-12 cars, thanks to a lightweight clutch pack in place of a power-sapping torque converter. Unique to the SL63, the MCT gearbox doles out ultra-quick shifts and a more direct connection with the powertrain, as well as a launch-control function for controlled, tire-hazing starts. Aided by the adjustable AMG Active Body Control suspension and stability programs, the SL63’s chassis, engine and drivetrain come together with the composure of a proper sports car. It won’t dance through a chicane like a Mazda Miata, and its bulk can be felt on narrow, sinewy roads. But the overall package adds noticeable sharpness to the once-sedate convertible, an improvement Mercedes says is most often requested by previous owners. Once underway, the SL63 is blazingly fast, with a deep V-8 roar that that couldn’t sound better if played through the new 510-watt Harman Kardon stereo. The claimed 4.6-second 0-62 mph (100 km/h) sprint feels rather conservative, and although Mercedes’ electronic limiter abruptly ends the fun at 155 mph (250 km/h), AMG has been known to deactivate it upon request. Adding the optional performance package ups the intensity with carbon-ceramic front brakes, a limited-slip differential, more-aggressive suspension tuning and different 19-in. wheels. Although all U.S.-spec SLs feature an AMG bodykit for ’09, the SL63, with its carbon-laced details, rear diffuser and gaping heat exchangers, appears far more aggressive without losing the fluidity of the original design. The look is substantial, in size and purpose, with muscular contours at nearly every angle. With the hardtop folded in the trunk like an origami swan, the optional Airscarf neck warmers (new for all ’09 models) pipe warm air through the headrests, while the AMG steering wheel (with shift paddles and the now trendy flat-bottomed rim) feels molded to your palms. The dual-pod gauge cluster also is new, as are the sport seats, which were comfortable after several hours in the saddle but could benefit from thicker bolsters in tight switchbacks. Overall, AMG’s performance fiddling takes little away from the luxury of the standard car. The SL63 is spacious and practical, with plenty of refinement and details that Mercedes gladly will add your personal touch to – on top of the near $135,000 sticker. What’s impressive is how capable the big drop top feels when pushed hard, when its grin factor comes within a smirk of true everyday supercars such as the Audi R8 and Porsche 911 Turbo.